During any active semester, my commuting routine every Monday through Thursday includes in part a brisk walk in the morning and again in the evening back and forth between Chicago’s Union Station and the Merchandise Mart, one of the buildings that houses The Chicago School of Professional Psychology where I teach. I cross over the Chicago River twice by way of the Madison Street Bridge and the Franklin Street Bridge. On very cold winter days, if I am lucky, I am able to catch the rare moments when fragile fragments of ice form like white mosaic puzzle pieces, floating downstream almost imperceptibly, seeming to seek and never quite find a pattern in which they will all come together perfectly. This winter, an intoxicated jet stream brought the record-breaking cold and winds of the polar vortex to Chicago, and I snapped some pictures of this ice phenomenon with my iPhone. The thing is, I will stand by the rail at the center of one of these bridges for quite a long time if the ice is floating. I just gaze at it, willing to abide the most painful chill for the privilege. I love arranging and rearranging the ice shards on an inner canvas in my mind, some stubborn part of me insisting beyond all reason that I can make them fit perfectly together, perhaps even recreating the original way they must have been connected before they broke apart and started to drift. The shards also awaken in me an inchoate sadness and longing, as another part of me accepts the futility of my mental efforts, knowing that no such “solution” exists—and that their heartbreaking beauty lies in their chaos, a natural randomness that contrasts starkly with the orderly buildings of brick, chrome, and steel that line the riverbanks. During the summer semesters, I sometimes have lunch on a bench along one of the banks of the river. Last summer, I sat with an elderly stranger who told me that he grew up with the river, and recalled the early 1980s when the river was fairly clogged with refuse until Mayor Richard M. Daley instituted a massive purification and cleaning effort. Even before that, he told me, in the early 1900s, industrial pollutants that were dumped mercilessly into it were responsible for the river being called “the stinking river.” Many folks, he said, even caught typhoid and other diseases from it. He explained that a series of canal locks were instituted to reverse the flow of the river, so that it no longer flowed into Lake Michigan but now flowed from the lake into the Chicago Sanitary and Ship Canal. All of these historical efforts served to significantly clean the river and restore at least a fraction of its once-pristine beauty. This knowledgeable man also related that in winter, the river develops strange, bidirectional currents that are not evident in warmer months. In other words, the surface of the river still flows away from Lake Michigan. However, a deeper current moves sluggishly but inexorably BACK to the lake. I experience an obscure reassurance somehow, that during what seems to be the most adverse and contrary season of the year, the river somehow strives to mysteriously return to its original template. Oh, I am quite certain there are natural and logical explanations for these phenomena, but my heart finds magic and comfort in this. In fact, the more I reflect on the history of this river as revealed by the elderly teacher of my serendipitous encounter, I am ever more astonished and pleased. The Chicago River has historically been abused in a manner that is beyond the pale with pollutants and litter. It has had its entire course and flow completely reversed. Every Saint Patrick’s Day, it is turned some toxic (albeit celebratory) shade of green. It has been cross-stitched with bridges, tamed and locked into orderly channels between mind-boggling skyscrapers, and exploited as a sort of highway for barges, yachts, tour boats, water taxis, crew practice, kayaking, and yes, even fishing excursions. Still, it manages to sing to me, and to produce the ice mosaics that so mysteriously mirror my own deep yearning for wholeness and completeness. The river, with its accompanying winter ice floes, has helped me understand that my fragmented psyche is never going to be pristine and whole in the way I once expected and wished for. Some parts of me connect and line up loosely, synchronistically, and even quite surprisingly, with other parts of me. This makes me almost believe myself that what I teach my students is true—that I move naturally and organically from fragmentation into wholeness if I learn to stay out of my own way. What truly happens though, is that all these beautiful fragments flow slowly downstream, even as deeper parts of me flow in the opposite direction. It is anything but orderly; yet it produces an experience of unexpected completeness that has little or nothing to do with putting the puzzle together perfectly. It has everything to do with healing and seeking beauty. 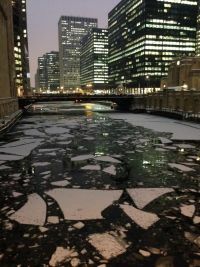 Like the Chicago River, I have suffered trauma and loss and have inflicted the pain of my injuries on others. Yet even challenged, and blocked, and coerced into channels not of my choosing, I flow. And I take my beautiful shards with me.